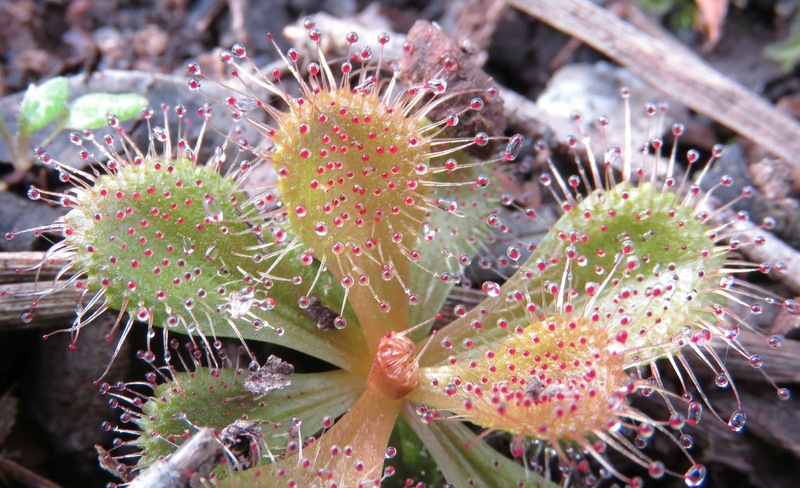 Back in 2010 I posted a note about a study showing that sundews don't worry too much about where they position their flowers (although there is the potential for them to eat their pollinators, this doesn't seem to be big problem). 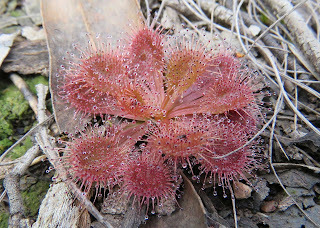 In that post I included a few pictures of sundews but, curiously given the topic, none with flowers. I followed up with some quotes from Charles Darwin about these glistening insectivorous marvels, including his confession that he was 'frightened and astounded' by his results and at that time he cared 'more about Drosera than the origin of all the species in the world'. Today I redress the image imbalance with some pictures of a rather common sundew in these parts, Drosera aberrans (previously known as Drosera whittakeri, a species now confined to South Australia), in flower. 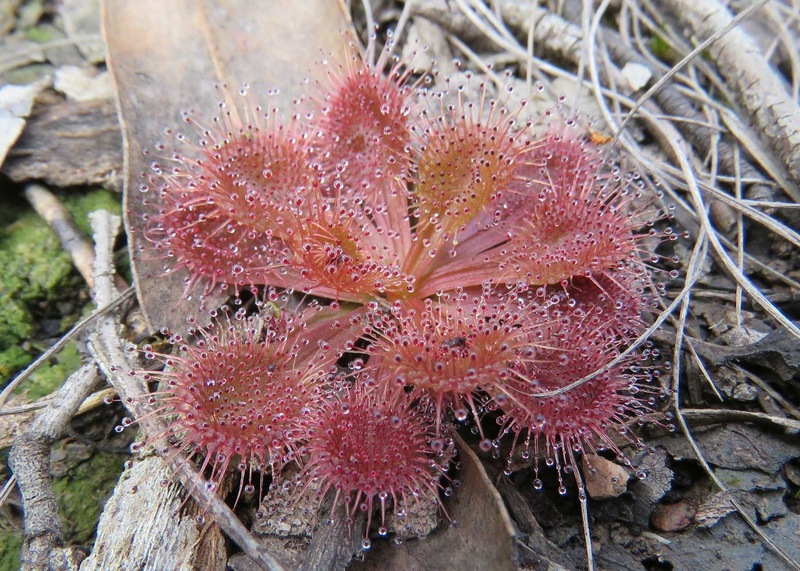 There are 90 species of Drosera in the world, with more than half (about 53) native to Australia. Drosera aberrans has simple ground-hugging rosette of green, orange and/or red leaves. 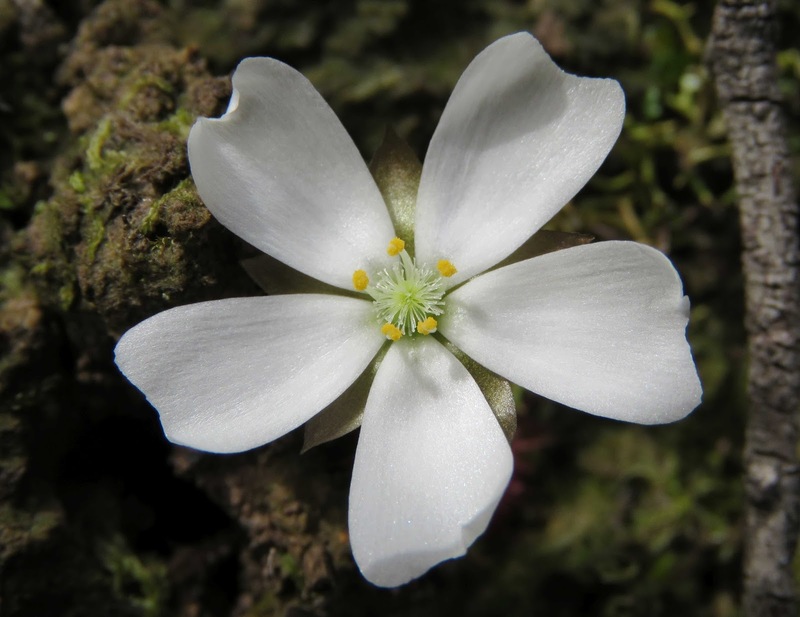 This species of sundew is constrained in its flower number (few rosettes produce flowers and when they do, there is one open at a time) but not so much in flower size (this white, dinner plate is big enough to almost shade the whole plant when open). You almost always find extensive clumps of rosette because its favoured means of reproduction is to send out a 'stolon', which can arise from the middle of the rosette, which will loop towards the ground and burrow into soil nearby to the mother plant. According to Alan Lowrie and John Conran, in their 2008 paper in Telopea raising aberrans from variety to species level, a colony of 'several hundred' rosettes may only produce a 'few flowers per season'. That's not true for this colony at Professors Hill in Warrandyte, on the outskirts of suburban Melbourne (in the following picture the flowers are closed, but you can see the many white flecks), and also for a population photographed in VicFlora (with beautifully opened flowers). 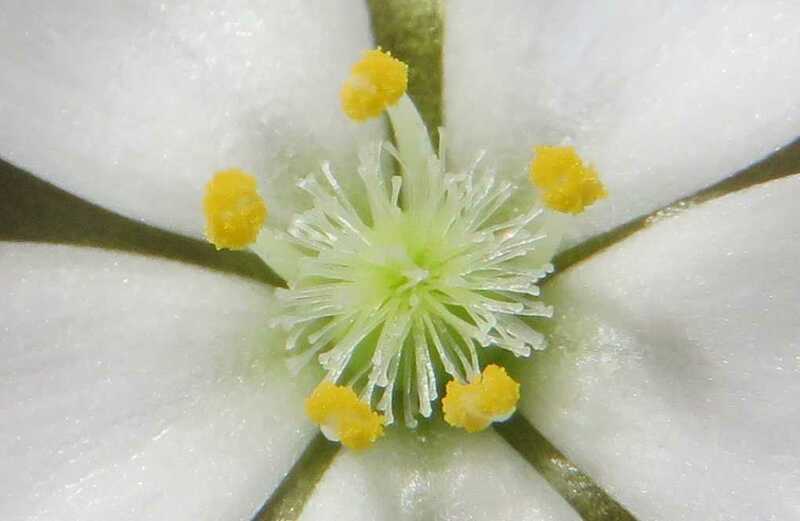 Each flowering shoot in the middle or a rosette can produce one to four (or in very fertile soils, up to seven) flowers, with only one opening at a time. This one has two flower buds and I saw up to four. Inside that lovingly produced flower you can see five stamens. These are the yellow pom-poms on chunky stalks. Bristling among them three styles (the female bits) divided into a hundred or so light green filaments. All Drosera species have leaves covered in hairs topped by a blob of sugar solution which acts as a glue catch insects. When an insect makes contact with one of the sticky hairs they trigger a response from the plant, with nearby hairs leaning towards prey and the leaf folding in. 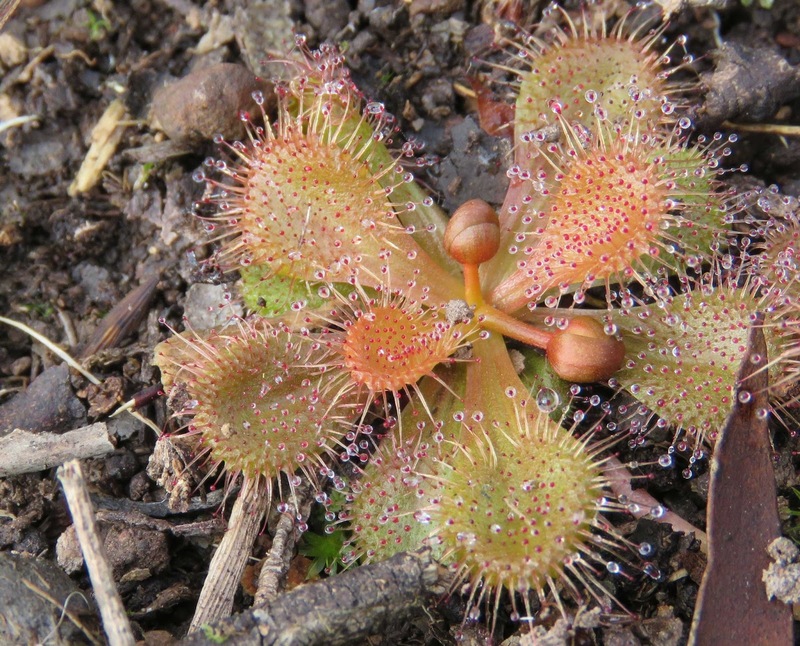 The sundew extracts nitrogen and other essential chemicals from the insect to help it live in nutrient-poor and often waterlogged soils. While not to a tiny insect perhaps, these are beautiful plants - glistening red, orange or green. According to Lowrie and Conran, the leaf colour is nothing to do with light exposure and you often find green-, orange- and red-leaved forms growing together, right next to single-colour colonies. Sun or shade, red or green. However plants do tend to become red with age. These pictures were taken in mid-August and the Drosera aberrans flowering season is July to September, although mostly in August and September, making it one of my 'sprinter' flowers (the wattles that characterise sprinter often start blooming in late July).